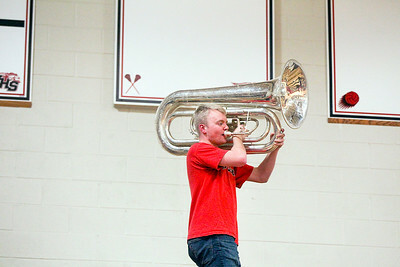 Sarah Nader- snader@shawmedia.com Huntley's Brian Zimmerman, 17, plays the tuba with the Huntley Band during halftime at Wednesday's girls basketball game against Crystal Lake South at Huntley High School February 3, 2016. Sarah Nader- snader@shawmedia.com Crystal Lake South's Chanel Fanter shoots a basket during the fourth quarter of Wednesday's game against Huntley at Huntley High School February 3, 2016. Huntley defeated South, 45-31. 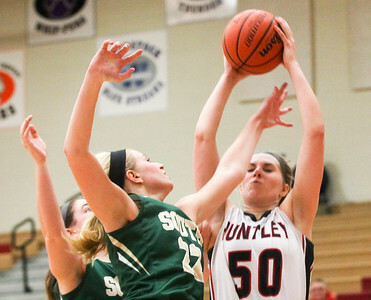 Sarah Nader- snader@shawmedia.com Huntley's Ali Andrews shoots a basket during the third quarter of Wednesday's game against Crystal Lake South at Huntley High School February 3, 2016. Huntley defeated South, 45-31. Sarah Nader- snader@shawmedia.com Huntley's Ali Andrews shoots over Crystal Lake South's Annika Sevcik during the third quarter of Wednesday's game at Huntley High School February 3, 2016. Huntley defeated South, 45-31. Sarah Nader- snader@shawmedia.com Huntley's Morgan Clausen (center) shoots a basket during the third quarter of Wednesday's game against Crystal Lake South at Huntley High School February 3, 2016. Huntley defeated South, 45-31. Sarah Nader- snader@shawmedia.com Crystal Lake South's Taylor Jozefowicz (left) is guarded by Huntley's Kayla Barreto while she shoots a basket during the fourth quarter of Wednesday's game at Huntley High School February 3, 2016. 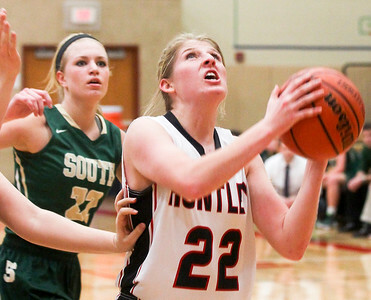 Huntley defeated South, 45-31. 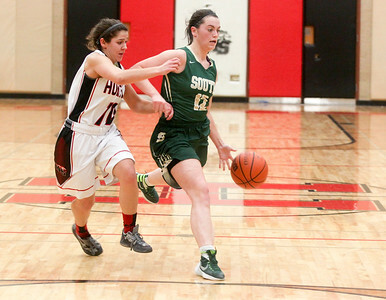 Sarah Nader- snader@shawmedia.com Huntley's Kayla Barreto (left) guards Crystal Lake South's Kelly Gaede while she dribbles towards the basket during the fourth quarter of Wednesday's game at Huntley High School February 3, 2016. Huntley defeated South, 45-31. 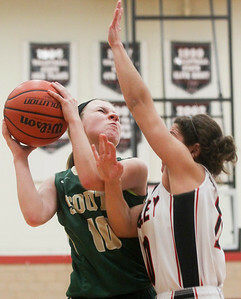 Sarah Nader- snader@shawmedia.com Crystal Lake South's Kelly Gaede shoots a basket during the second quarter of Wednesday's game against Huntley at Huntley High School February 3, 2016. Huntley defeated South, 45-31. 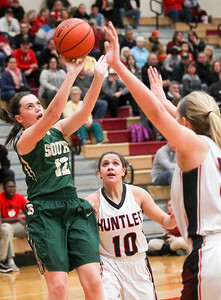 Sarah Nader- snader@shawmedia.com Huntley's Alexis Lowitzki (left) shoots over Crystal Lake South's Annika Sevcik during the first quarter of Wednesday's game against Crystal Lake South at Huntley High School February 3, 2016. Huntley defeated South, 45-31. 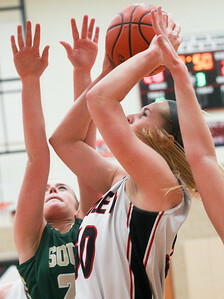 Sarah Nader- snader@shawmedia.com Huntley's Paige Renkosik shoots a basket during the third quarter of Wednesday's game against Crystal Lake South at Huntley High School February 3, 2016. 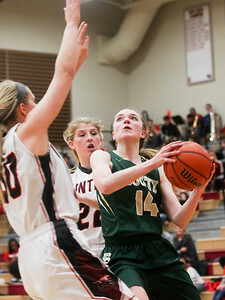 Huntley defeated South, 45-31. 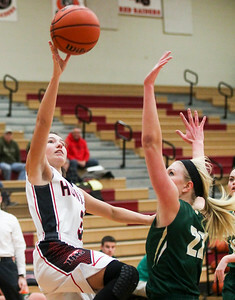 Huntley's Ali Andrews shoots a basket during the third quarter of Wednesday's game against Crystal Lake South at Huntley High School February 3, 2016. 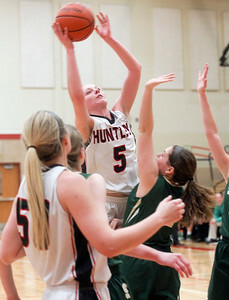 Huntley defeated South, 45-31.